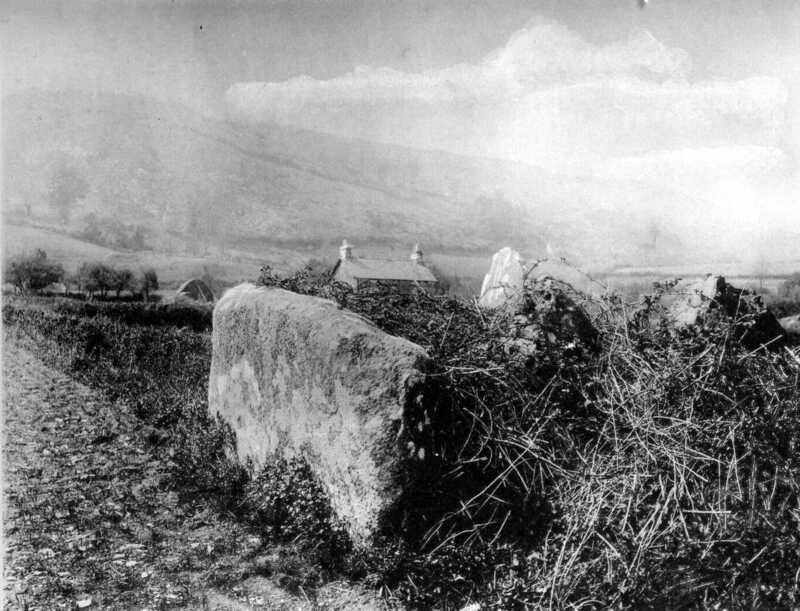 This fine Cromlech is on the left-hand side of the road from Conway to Trefriw, on a farm called Porth Llwyd. The capstone has fallen down from its supports and is lying edge-wise on the ground. There are still standing three of its supports. The one next to the road is five feet six inches long by three feet wide, and the one that faces the north-east is five feet long by three feet six inches wide, while the one nearest Conway River is six feet long by two wide. The other supports that belonged to it can easily be traced, and are now serving as posts to a gate close by. The capstone lies on its edge close to the supports that are standing. It is ten feet long, and five feet wide at the end nearest to the road, and four feet at the other end, and it averages from twelve to fourteen inches in thickness. The space within what once formed the chamber is now full of debris, and overgrown with briars. This Cromlech could easily be restored. Not recorded in Arch. Camb.